Our reviewer describes herself feeling as unfamiliar as a "Martian" when it comes to transitioning from graduate-level education to the art world. But how helpful is this book, especially as an American-focused resource, to our German "Martian"? 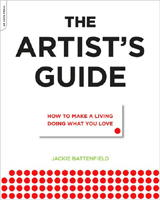 Jackie Battenfield’s The Artist’s Guide: How to Make a Living Doing What You Love is like a Martian’s guide to succeeding in the art world: a place in which, as a recent photography graduate, I sometimes still feel like I’ve just landed on a strange planet (with many new requirements). But even art-scene aliens will probably grasp the importance of social contacts and self-promotion after reading this book. Jackie Battenfield is a New York-based artist, who also teaches professional development at Columbia University and the Creative Capital Foundation. She writes from her own experience as a former non-commercial gallerist and current art practitioner. First, an overview: the book’s laid out in a didactic kind of structure, starting with life-planning, developing short- and long-term goals and action plans to achieve them (Section 1). This includes things like artist’s statements and keeping pictures of your work on file for professional purposes. The next chapter is about networking, researching and approaching different institutions and maintaining professional relationships. Section 3 deals with acquiring and managing money but also legal issues, such as copyright, contracts, etc. Lastly, Section 4 tackles time management and organising your art day-to-day operations and build a supportive community. Interestingly, although I’ve encountered most of these issues in my own life (pricing of work, copyright, contracts, freelance photography jobs etc. ), I never really thought about them as much as I did while reading this book. It has become clear to me that it’s actually thinking about them in advance that could save me a lot of time and trouble. Although this guide has a strong focus on an American art context, I’d still recommend it for German readers, especially because we don’t have a long tradition of private or corporate art sponsorship like the US. We also might be trained to be too passive, or not comfortable with the idea of taking a more active approach to acquire funding for our own projects. In Germany, I’d say the myth of the pure—but broke—artist is still very much part of the collective psyche. When we told our parents that we wanted to become artists, they basically told us to do something else! This "something else" ended up being a career that would enable us to earn money, buy a house, a car, gain social recognition, etc. By choosing to become artists we’ve made ourselves slightly different from society—its values and structures. Being broke is not cool! But that just means there’s an even bigger urgency for emancipating ourselves from those ideas by taking charge of our own slightly un-German lives and their economic pitfalls. Being broke is not cool! You need to find ways to promote your art, especially if you want it to reach people and possibly change something. I’m not saying that we should sell our souls, or that self-marketing should take priority over artwork, but I entirely agree with Battenfield in that artists everywhere would benefit from cultivating some business knowledge and autonomy. Overall, I really liked the book. Having finished my photography degree last year, the book’s motivating and very positive American tone came at just the right time to help me avoid a rut! And the book is right: I CAN DO IT…! I just need a good plan. The Artist’s Guide holds a lot of valuable information and tips and I’ll probably return to it in the future—a practical and rewarding read!